The concept of Flying Cars has always been a fiction. We have grown old seeing this virtual and very fascinating idea in Science fiction movies like Bang Bang and Harry Potter. But what about now…? Modern technology has turned this very idea into a reality. Imagine yourself stuck in the middle of traffic. How cool it can be if with just a switch of button you can get yourself flying with your vehicle. Well modern revolutionaries have gone deep into this concept and developed a merger of car and planes, and this roadable aircraft can be very well termed as flying cars. The outcome was a small plane, that could fold its 8m long wings in just 30 seconds and can fly at a speed of 172 kph and drive at a speed of 105 kph. This very first introduction in the world of Flying cars was Aerocar by an American inventor, Moulton Taylor in the year 1956. 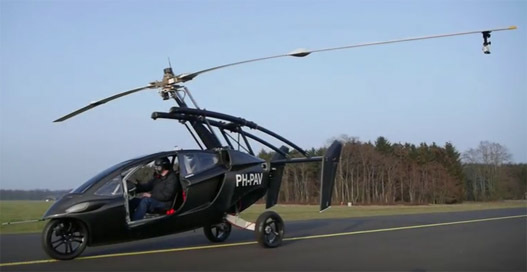 These flying cars provide us with all the convenience in their keeping, they can be refueled at any normal petrol station and the driver of the same requires both a driving license and a Pilot license. With Aero Mobil recent announcement about launching a new series of Flying cars, we can get ourselves ready for take off with gears in our hands. This indeed is a very great news for the fans of Flying cars, since their dream of flying would be realized soon. Let us now have a quick glance over the history of these flying cars and get ourselves acquainted with some unknown facts about the same. 2017 will be the year when Aero Mobil 3.0 will hit the grounds with its launch and get us all going gaga over it. This tech Giant headquartered in Slovakia, has worked hard on this idea and come up with most amazing outcome in its category. 1. The car would be real transformer, it would take less than 30 seconds in its wings to open and function and make a transformation from a car to plane. 2. COST : If you are thinking of getting this super model in an affordable budget, then you might be disappointed, since for now the company has designed the car keeping in focus only the Wealthy supercar buyers and flying enthusiasts. The price has not been set yet but it would cost you thousands of Dollars to realize this dream of yours. But since initially even the computers were not the thing of every body’s command and yet we find it at most feasible prices now. This same promise has been made by the company that soon it would launch something for consumer- level too. 3. RANGE : the price undoubtedly is very high, but the thing you get in return is worth the cost. The range of this model will be around 700 kms , that is approximate distance from Pittsburgh to Chicago. So, we would be fully contended with this long range that car an cover in one go. 4. SAFETY : The company has taken full care of the safety of the passengers of the cars. Their primary concern has been their safety since the flyers would not be people with high experience in the same. The car hence comes with a partial auto flying mode that enables it to take control in case of a mishap and to further add to it, the car comes with parachutes to provide the passengers a full fledged security system. 5. PURPOSE : The Flying cars would fulfill all your luxury dreams and set you high with tis amazing experience of Flying. The major concern has been to able you to evade the situation of heavy traffic on roads and largely congested airports. Your personal airplane can even take you to places without proper accessibility of transport and roads, hence you can believe that all your dreams of travelling to the most exotic place will come true now.